by Chris Woodford. Last updated: November 16, 2018. Imagine spending your entire life worrying about nothing. If drilling is your business, that's exactly how you pass your time—figuring out how to spin wood, metal, rock, or some other obstinate material into nothing but a hollow shaft of empty space. You might think drilling sounds like an immensely dull subject, but it's a scientific and technological challenge that's been taxing people since the first drills were invented around 4000BCE. It's become vastly more important in the last 100 years or so for, for if there were no drilling, we'd have no petroleum—and no cars or trucks—and the modern world would look much more like the horse-drawn buggy era of the 19th century. Without drills, how would you cure a toothache, build yourself a home, or extract long "cores" of ice to confirm that climate change really is happening? This stuff is actually pretty important... so let's take a closer look! 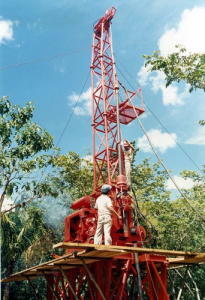 Photo: Drilling with a coring rig on a coffee plantation in Guatemala. Photo by Sue J. Goff courtesy of Los Alamos National Laboratory Publications and US Department of Energy. Photo: Precision drilling to bore out the center of a pump shaft. The "engine" of this drill is a powerful electric motor. Photo by Kilho Park courtesy of US Navy. Easy! A drill is a machine that makes holes in something —but is it as simple as it sounds? It's a machine in two senses of the word. The kind of drill people use for household DIY has an electric motor, so it's a machine in the sense of being a useful, everyday, electrical appliance. But it's also a simple machine in the strict scientific sense, where a machine can be literally anything from a can opener to a monkey wrench—anything, in other words, that helps a person to multiply the force they can produce with their own muscle power. Every drill needs some sort of a power source, which we'll call the engine. In a brace-and-bit (a simple woodworking drill), the engine is an off-centered crank that you turn by hand to make the drill rotate using the muscles in your arm. A modern household DIY drill is usually driven by a powerful electric motor with a gearbox that can increase or decrease its speed. At the opposite end of the scale, outdoor drilling rigs are powered by giant diesel engines or pneumatic compressors (machines that drive a drill using the force of compressed air blowing down a pipe), which are themselves typically powered by diesel engines. Apart from the power source, the other key part is the drill bit, the rotating, rod-shaped tool that cuts or bores into the material you're drilling. A bit is made up of three parts: the shank (the upper part that fits into the machine), the body (the area between the shank and the point, with twists running along it), and the point (the end of the drill bit that does the cutting), which, itself, is made of lips (sharpened cutting blades) and heels (larger supporting areas behind the lips). In something like a DIY electric drill or a bench drill in a workshop, the drill bit is connected to the engine (motorized part) of the drill by a vise-like clamp called a chuck; you tighten or loosen the chuck's jaws to change one bit for another, either to make different sized holes or when the bit has worn out through use. Photo: A typical steel "twist" bit from a hand drill. Note the sharpened end and the auger screw along the length of the bit to carry waste material up and away from the cutting edge. Most drill bits have two features: a sharpened or tapered end that cuts or scrapes the wood, metal, or other material out of the way and a spiral screw thread (called an auger) that lifts the material up the hole and out of the way. 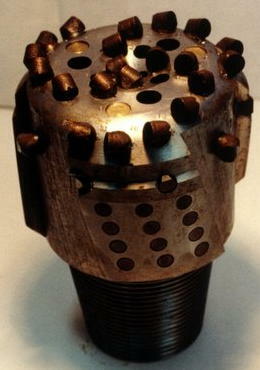 Sometimes drill bits are coated with super-hard materials such as tungsten carbide (a compound of tungsten metal and carbon) to stop them wearing away quickly; often, though, the drill bit and shaft are made from a single piece of very hard steel capable of withstanding high temperatures—typically high-speed steel (HSS) or carbon steel. The temperature resistance is really important because (for reasons explained in the box below) drilling generates a huge amount of heat, which can damage the material being drilled as well as the drill itself. That's why drill bits are often designed to allow cooling fluid (sometimes plain old water) to be piped to the cutting edge, which has an important side benefit: as the cooling fluid arrives, it connects with the waste material being drilled and helps to carry it away and clear of the bit, easing the bit's onward passage. It's sometimes called a cutting fluid. Okay, so this isn't exactly a part of the drill! Even so, the hole—the empty, end-product of drilling—is the most important part of all. Unless you're making a very rough-and-ready hole (say, drilling quickly through the center of a new wooden front door so you can push a saw blade through and cut yourself a letterbox), the size of the hole you're drilling is often critically important. It might have to admit, very snugly, a precisely machined bolt, screw, or other part so it will have to be exactly the right diameter (neither too big nor too small); that's why drills have interchangeable bits that come in a huge range of different and very precise widths. Less obviously, most holes have to be absolutely straight and perpendicular (at right angles) to the material you're drilling into. That's partly why metal drills in workshops are mounted on little towers called presses and operated by a hand lever. Photo: Are holes really so important? Yes! Tunnels are examples of large-sized holes made by machines like this, called tunnel boring machines (TBMs or "moles"), which are essentially horizontal drills driven along tracks. The cutting head is on the right hand side (furthest away from us in this picture). Photo courtesy of US Department of Energy. 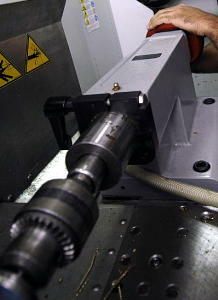 Often drilling a hole is only the first stage in a process. Sometimes the hole has to be enlarged with other tools (a process known as boring) or finished off in various ways. When you drill a hole through metal, for example, burrs (sharpened shards of metal) are pushed through the hole and emerge at the exit hole, and they have to be removed with a file. If you're drilling a horizontal hole underground for a subway tunnel, you generally have to reinforce it with concrete to stop it from collapsing. The same applies to vertical shafts drilled through the ground into oil wells, which are immediately reinforced with steel pipes and cement. Exactly the same can apply to simple holes you drill in your walls at home. 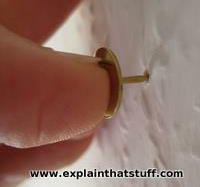 If you're making a hole in a plaster wall to support something like a bookshelf or a heavy mirror, you typically have to line the hole with a plastic plug so it holds a screw snugly and securely. What's science got to do with making holes? Quite a lot, actually. Here are some of the more obvious ways that science comes into drilling. Note how I'm applying general scientific principles to understanding a very ordinary, everyday aspect of the world—that's the essence of science! 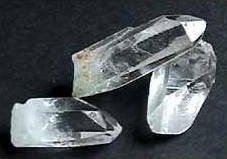 Photo: Crystals of quartz are surprisingly hard—harder than many steels, in fact. But they'd be no use if you wanted to drill something harder than quartz. Photo by courtesy of US Geological Survey. Any material is harder than (and can scratch) another material with a lower Mohs hardness number. It comes as no real surprise that drill bits are made from materials high up the Mohs scale. Diamond (the industrial kind, not the ones you wear on your fingers) is the hardest material, right at the top of the scale. Tungsten carbide, another popular drilling material, has a Mohs hardness of 8–9 (compared to ordinary tungsten, which is about 7–8), whereas high-speed and carbon steel used in everyday DIY drill bits comes in at about 6–7. By comparison, fingernails rank about 2–3 on this scale (maybe slightly less when you've just crawled out of the bathtub), which is why you'll often break your nail if you do something silly like trying to undo a screw (Mohs 6–7) with your fingers. Photo: Conservation of energy: When you use a cordless drill like this, energy flows from the rechargeable battery pack on the base of the handle into the electric motor inside the case, the spinning drill bit, and the wall itself, heating all of them up in the process. Your body supplies extra energy by pushing the drill against the wall. When the drilling's done, the electrical energy lost from the battery pack (and your body) is equal to the heat energy gained by these other things, plus the sound energy wasted in making that awful whiny, screeching noise! Photo by Dennis Schroeder, courtesy of US DOE/NREL (Department of Energy/National Renewable Energy Laboratory). In theory, it takes the same amount of energy to make, say, a 5cm (2inch) deep screw hole in a plaster wall, no matter how you do it: in scientific terms, you have to "do work" on the wall by applying a force for a distance of 5cm. You can drill a hole like this more quickly with an electric drill than by hand because the electric drill supplies energy to the wall at a faster rate—it's more powerful, in other words. If you use a drill with a higher power rating (with, say, an 800-watt electric motor) it will make the same hole more quickly than a drill with a lower power rating (maybe a 650-watt motor): the hole takes the same amount of energy to create, but the powerful drill supplies that energy at a faster rate—in less time. The work you do in drilling is converted mostly into heat and lost forever. Notice how hot your drill and drill bit have got when you've finished? That's a measure of how much energy you've had to expend to drill your hole (and some—because your drill isn't 100 percent efficient). 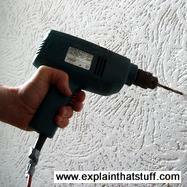 Think about drilling a hole into your wall with an electric drill. If you've ever tried doing this, you'll know that it's quite hard work, even with a powerful electric motor helping you out. Pushing a drill into a wall is a bit like pushing a thumbtack (drawing pin) into a noticeboard, with everything scaled up in size. The fact that the drill body is wider than the drill bit means the pushing force you apply is concentrated into a much smaller area, so it bites into the wall with greater pressure. In other words, it's easier to push the drill into the wall than if the bit were wider than the drill. Photo: Science of pressure: Drilling into a wall is like pushing in a thumbtack—scaled up in size! Before power steering came along, trucks and buses had enormous steering wheels to make them easier to turn round corners. As we explain in our main article about how wheels work, a wheel mounted on an axle is another kind of simple machine. If you turn the rim of a large wheel, the axle at the center turns more slowly but with much more force. In other words, a wheel acts like a lever and the bigger its diameter, the more leverage it provides. The same thing happens with a drill. If it has a large chuck that rotates a tiny bit at its center, you get leverage, and the bit powers into the wall with more force than if the chuck and the bit were exactly the same diameter. 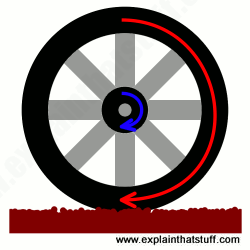 Photo: Turning the edge of a wheel (red arrow) produces a bigger force at the center (blue arrow). What do you do when your hands are freezing? Rub them together—because rubbing things converts the kinetic energy (the energy of movement) into heat energy that warms you up. When you're drilling, friction and heat become a problem. Using a simple hand drill for just a couple of minutes can make the drill bit too hot to touch—don't try, because you might burn yourself. 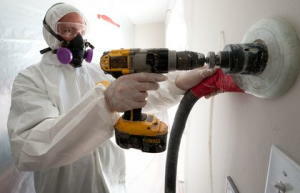 Using an electric drill that spins many times faster will generate much more heat. Generally speaking, the faster the drill turns and the longer it operates, the more heat it generates. Where does the heat come from? It's back to energy again. An electric drill converts electricity into mechanical energy (in the rotating drill bit) using an electric motor. As the drill bit bites into the material you're drilling, the mechanical energy is converted into heat energy. Unless you get rid of the heat somehow (by pumping in a cooling fluid or pausing your drilling every so often to let things cool down), it builds up—and there's a risk you might melt or burn the material you're drilling or damage the drill bit. Most of the drilling we've considered so far has been the kind of stuff you might do at home as part of a DIY project: small-time drilling, in other words. But what about big-time drilling—getting oil from the ground and so on? Broadly speaking, there are two kinds of industrial-strength, outdoor drilling called rotary drilling and percussive drilling. Photo: A new section of drill string is winched into place on a typical rotary drilling rig. Photo courtesy of Craig Miller Productions and US Department of Energy. Rotary drilling is what you'll have seen people doing on oil rigs. They make a hole in the ground and gradually push a very long drill further and further down. Unlike a household DIY drill, the drill bit used in rotary drilling isn't a fixed length. To go deeper and deeper, the drillers have to keep stopping and adding new sections of drill bit (which look like pipes) on to the top as they go, making the bit into an ever-lengthening piece of metal (sometimes kilometers/miles long) called a drill string. The string is powered either by a motor sitting straight on top of it (that's known as a top drive) or by a kind of spinning collar arrangement (called a Kelly drive and rotary table), itself powered by a nearby diesel engine, and typically turning at over 100rpm (roughly how fast a clothes washer goes when it's spinning very slowly just before a really fast spin). At speeds like this, and great distances underground, heat buildup is a major problem so cooling/cutting fluid called drilling mud is constantly pumped down into the hole (and used to carry the waste, known as cuttings, back up again through the hollow inside of the string). Drill bits have to be incredibly tough to survive in these conditions, so they're made from hardened materials like tungsten carbide or industrial diamond. Artwork: The derrick and other main parts of a simple rotary drilling rig. The rig is supported by a tall, metal tower called a derrick. The rotating part of the drill is raised and lowered by a pulley (block and tackle) at the top of the derrick. The top part (upper red circle), which is fixed at the top of the derrick, is called the crown block; the lower part of the pulley (lower red circle), which moves up and down, is called the traveling block. In some rigs, the drill is rotated by a motor or engine at the top; that's called a top-drive rig and it's what's shown here. 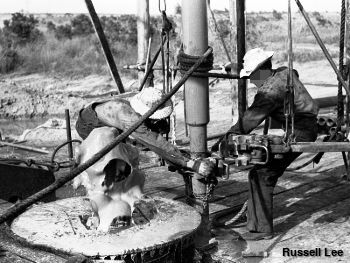 In other rigs, the drill is turned around by a spinning collar closer to ground level, called a Kelly drive and rotary table. If you imagine the drill string as a very long bolt, the Kelly is a bit like a nut permanently fixed to its outside: just like a nut, it has straight edges around it. The rotary table locks and spins the Kelly just like a spanner turns a nut, except that the Kelly and the drill string spin around continually. With the help of the pulley at the top, the drill string is gradually extended so it digs deeper and deeper into the ground. The string has a spinning bit at the bottom (yellow and black). Drilling fluid (mud) from a pit or tank is pumped down the inside of the drill string and comes back up the outside, carrying the cuttings. The cuttings are removed from the drilling fluid by sieve-like shaking screens. You've probably heard the word "percussion" being used to describe instruments such as drums, but it's used in a more general sense to talk about things that we hit. So a percussive drill is one that's driven into the ground not by an engine that spins it around but by repeated blows from something like an air compressor. A jackhammer (pneumatic drill) is the smallest kind of percussive drill; at the other end of the scale, construction work often involves much larger kinds of percussion drilling, such as using a piledriver, where foundations for a building or bridge are smashed into the ground with repeated blows from a huge machine. Depending on the terrain, this kind of work can be amazingly slow and laborious: it can take hours to drill piles down only a few meters (feet). Photo: This diamond-studded drill bit (technically known as a polycrystalline diamond compact or PDC bit) is typical of the bits used for rotary drilling through hard rock. Photo courtesy of Sandia National Laboratories and US Department of Energy. On an even bigger scale, percussive drilling can be used to drill holes down over 1km (0.6 miles) into solid rock. When the going gets really tough, big-time drilling uses super-heavy-duty tools that combine the spinning power of a rotating drill string with percussive blows applied to a hammer-type bit at the bottom: think of a mini-jackhammer, powered by compressed air, spinning round on the bottom of an oil-rig-type drill string and you're in the right neighborhood. This is called air drilling and comes in numerous different types and variations, largely governed by the type of ground, the depth and diameter of the hole that needs to be drilled, and the reason the hole is being drilled in the first place. 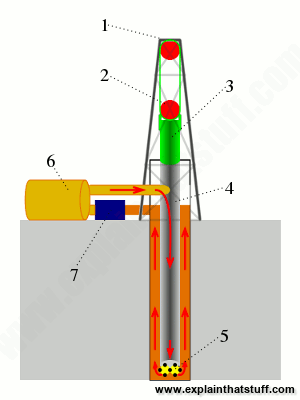 In rotary air percussion drilling (also called rotary air blasting (RAB) and "down-the-hole" (DTH) drilling) the drill string spins around as usual but, at the bottom, instead of a simple drill bit, there is a much more complex, pneumatically-powered drill mechanism called the hammer. It has a strong steel casing with lots of small tungsten rods called buttons that constantly move in and out, like small jackhammers, as the drill string spins around, chipping and blasting away at the rock. In conventional down-the-hole air drilling, the drill string is rotated at the top and compressed air is fed all the way down through the drill string so the percussive blows are applied only at the very bottom, immediately behind the drill bit. That saves wear-and-tear on the long drill string and all the joints that hold it together. Tophammer drilling is similar, but the percussive blows are applied at ground level to the top of the rotating drill string. Where does the waste material go when you're drilling miles underground? In conventional air drilling, the compressed air goes down the very center of the drill string to power the the hammer bit at the bottom, blowing the cuttings back up the outside of the string. Another method called reverse circulation forces air down through the rim of the drill string, which blows the cuttings back up the middle of the string. Precision Machining Technology by Peter J. Hoffman, Eric S. Hopewell, and Brian Janes. Cengage, 2019. A very comprehensive student's textbook that covers all aspects of machining, from the tools themselves to related issues like measurement and safety. Advanced Drilling Engineering: Principles and Designs by G. Robello Samuel. Gulf Books, 2009. Drilling Engineering by Jamal J. Azar, G. Robello Samuel. Penwell Books, 2007. Drilling and Excavation Technologies for the Future by National Research Council (U.S.). Committee on Advanced Drilling Technologies. National Academies Press, 1994. 161-page report summarizing likely future developments in drilling (back in the mid 1990s). Quite a bit viewable online via Google Books. Digging for Geothermal Energy with Hypersonic Projectiles by Evan Ackerman. IEEE Spectrum, 23 July 2015. A new type of "drilling" does away with the drill bit entirely; it fires bullet-like projectiles into the ground instead. Green machine—inside the world's biggest jack-up drill rig by Heidi Vella. Offshore Technology, 3 March 2014. A new $730 million oil rig is designed to drill down in a maximum water depth of 175m. The World's Largest Tunnel-Boring Machine by Erin Brodwin. Popular Science, 11 November 2013. 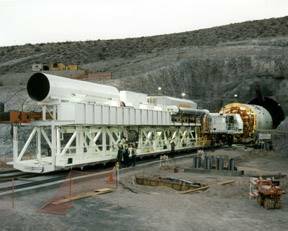 A look at Bertha, a giant tunneling machine driven by a 25,000 horsepower engine. Ocean monster shows hidden depths by Richard Black. BBC News, 28 May 2009. A trip onboard an ocean-drilling ship, with some good animations and graphics explaining how it works.